What are labels and how to create them? Labels are like tags that can be assigned to the answers of an inspection item, depending on the rules that is met. These labels can be used later on for reporting purposes as well, to identify patterns. Click on 'New' button on your 'Manage Inspections' home screen to start creating a new label. Enter the name, description and choose a color to identify the label easily. 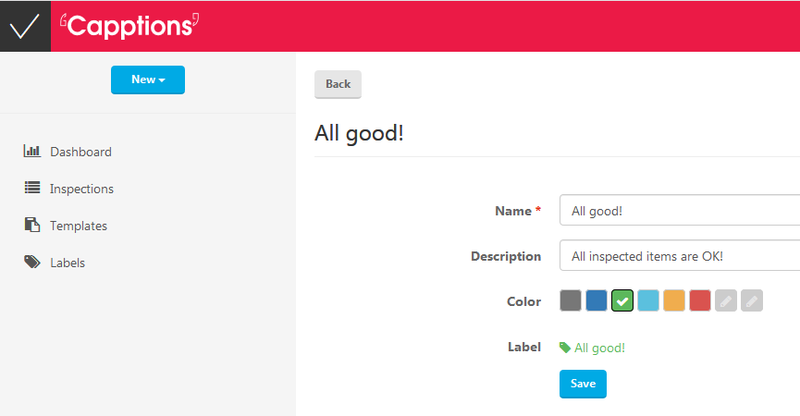 You can use the 6 color standard palette or use the last 2 non-colored icons to create and use your own customized color. Click on 'Save' and this label will be added to your organization's directory for any future usage. You can see all available labels by clicking on the 'Labels' button in the left side panel of your 'manage inspections' screen. Where to find the labels that were automatically applied when a rule was met in inspections? Click on "Manage inspections" and then on "Inspections", located on the left side. The column "Label" will display all labels that were applied on each inspection based on the rules that were met. Additionally, it is possible to filter inspections by label.